Soichiro Honda was the founder of the Japanese manufacturer Honda, which has been the world’s largest motorcycle manufacturer since 1959. Born in Japan in 1906, his childhood was spent assisting his father in his bicycle repair business. After training as a mechanic he started his own auto repair business in Hamamatsu. In 1937 he founded the Tōkai Seiki Company to manufacture piston rings which he sold to Toyota, a prominent Japanese car manufacturer. Honda later sold the remainder of his business and used the money to fund the Honda Technical Research Institute in 1946. The following year he began manufacturing motorcycles from the Honda Motor Company and within a decade Honda became the leading motorcycle manufacturer in the world. Through effective marketing they entered the American market and opened the first U.S dealership in 1959. 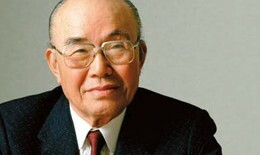 As President, Honda helped to advance the Japanese business sector and he was recognised as being one of the few CEO’s who promoted executives on performance rather than age. He served as President until his retirement 1973, yet continued to work with the company as its Director. He died in 1991 and was appointed a Grand Cordon of the Order of the Rising Sun.